For most, the morning commute is a dreaded affair. During the winter months, when the weather worsens the dreary conditions, your wardrobe can take a beating. For those of us slaves to public transport during the a.m, the journey is made that much more intolerable. Dressing in a practical and refined manner, whilst considering every possible scenario you might encounter, is particularly challenging. Many of us are aware of the silly o’clock trudge through the city streets to a bus or train station. The generally polar temperatures endured between walks to and from the station make for uncomfortable journeys and poorly chosen outfits. Remaining put-together through this type of commute isn’t easy at the best of times and will require expert layering in order to navigate successfully. What follows is a selection of items and techniques to help you look as good as you did in front of the mirror when you cross the office threshold. The change in temperature from outside to in makes picking clothing for this occasion an often frustrating task. Being able to remove/add layers with as little hassle as possible – and without disturbing the synergy of your look – is the key to successful layering and a good winter morning commute outfit. Integrating knitwear should be your first port of call when looking to tackle the morning commute. Used as a middle layer, knitwear provides warmth, detail and colour as well as the ability to remove a layer whilst still looking sharp and ready to work. A simple merino wool (or cashmere, if your budget allows) knit is the perfect choice, as they are lightweight and form fitting – allowing it to fit under your blazer effortlessly. Neutral colours make for easy, stylish options that refuse to clash with anything. On the other hand, bold but simple winter colours like bottle green, burgundy or even orange can add personality and depth to a traditional grey or navy suit. Diversify your commuting attire by layering with quilted or down-filled pieces. A lightweight gilet or jacket brings both sufficient warmth and additional texture to your look – a key visual component of successful layering. Quilting is similar to down in that it is a texture unlikely to be already present in your outfit. While a warm alternative to knitwear, it is unlikely to match down garments for insulation and lightweight properties. Zip up a down gilet or thin quilted jacket underneath your suit to bring the aforementioned texture and warmth to your commute wear. Alternatively, you could layer the down or quilted garment over the suit jacket, providing it covers the blazer tails. Finally, this season’s (and AW13’s) must have outerwear style – the parka – is a great alternative to your traditional overcoat or trench. Available in padded or unlined versions, a parka will help add a rugged, masculine edge to your traditionally ‘stuffy’ work suits and is versatile enough to be dressed down at the weekend with jeans or chinos. We wax lyrically about how important accessories are in completing and complementing an outfit. When it comes to your morning commute they serve a more practical purpose whilst also aiding in the aesthetic of your chosen ensemble. A good selection of accessories will help keep the elements at bay and remain as manageable as possible. You don’t want to be carrying a bundle of scarves, hats and gloves as well as the coat you’ve just removed. Choosing wisely, based on weight and warmth, will ensure you aren’t left scrambling uncomfortably when the time comes to disrobe due to an increase in temperature. Scarves are fairly self-explanatory; something neutral and sensible is impossible to go wrong with. On the other hand, they are a great piece to use to inject some colour or pattern if you’re confident enough to play with them. Hats, on the contrary, are a much more difficult domain when it comes to dressing smart and successfully for the morning commute. A beanie paired with a suit doesn’t do anybody any favours, at all, ever. The safest option to go for (providing you have the correct face shape to pull off headwear) is the driving cap. Braver gents among us will favour more structured brimmed headwear such as a fedora or trilby. Completing the sacred trio of winter accessories is, of course, gloves. 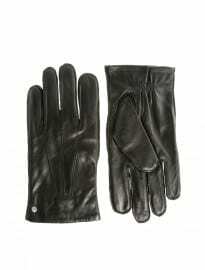 A leather pair look sleek and sophisticated, adding a metropolitan edge to your commuting effort. If you’re a touchscreen user, ideally you want to shop around and aim for a pair of gloves that have the capability to work seamlessly with your technology. Last, but by no means least, is the faithful umbrella. A good shower defender will be a safe and sturdy companion during the long winter travels. With the weather verging on the extreme at times, it’s worth putting money into an investment ‘brolly’ rather than those sold outside tube stations when downpours hit. A full-size umbrella looks great but can again become unmanageable when you’re fumbling around with other items of clothing. In these cases, a pack away sort becomes incredibly handy, but once again it’s still worth spending that little bit extra so it doesn’t break on the first use. The perfect balance between style and practicality can be hard to achieve, especially if you are working against the elements, public transport, time restraints and crowds of (typically stressed) people. Therefore, getting your morning commute outfit right before you step out of the house can help make the journey that much more bearable and ensure you arrive at work ready for business. How do you style your morning commute outfit in a practical fashion? Do you use any of the items and techniques above? Do you have any unmentioned tips to help brave the elements en route?